The Chevy Volt is an excellent car and one of the most advanced on the market. It’s a potent mix of electric and gasoline, and one that should help mitigate fears regarding range anxiety. Politics have a way of creeping into virtually all facets of our lives, whether we want them to or not. So when one of the most advanced electric cars hit the roads in 2011 after a helping hand from Uncle Sam during its development, many from outside the auto industry saw it as a political tool of the Obama administration. Lauded by members of the left and ripped apart by the right, the Chevrolet Volt rolled onto the scene with a great deal of hype (warranted) and controversy (semi-warranted). Three iterations later, the Volt lives on as one of the most technologically advanced cars on the market, and the buzz around it has subsided. For 2013, it also packs in some minor enhancements, making it an even more attractive option – if you’ve got the green. Step inside the 2013 Volt, lay witness to its smart interior, and you’ll immediately feel the inherent charm of its design. Admittedly it’s more of a tickle than a punch to the gut, but it’s impressive nonetheless. There is an undeniably cutting-edge vibe to the dash and center console – itself a skyward-stretching, towering obelisk of digital wonder. The materials employed throughout the cabin look and feel great. Our review model came equipped with the Volt’s Premium Trim package ($1,395), which included leather-appointed seating, bum-burning heated front driver and passenger seats, a leather-wrapped steering wheel, and a rear seat removable armrest. Like past models, the Volt features a 2+2 arrangement. Up front, the center console is divided by two cup-holders and a center armrest, while the rear seats are similarly separated due to the placement of the car’s battery pack. While it might restrict the squeezing in of a fifth passenger, the twin-cockpit arrangement is quite nice, and affords a decent amount of space for riders in the back. Sadly, cargo space is somewhat limited. The Volt provides a meager 10.6 cubic feet with the rear seats up, so don’t expect to haul much baggage around town. 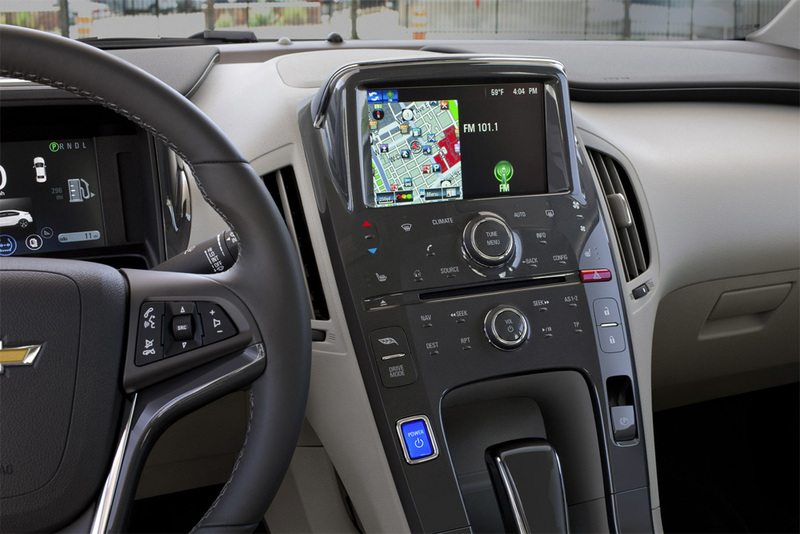 The 2013 Volt comes standard with Chevy’s MyLink infotainment system, which beams out of a 7-inch LCD touchscreen display atop the center console tower. Interaction with MyLink is done primarily through the touchscreen, which reacts relatively quickly to prods. In place of traditional buttons, the Volt features capacitive touch controls – essentially buttons that don’t click. They certainly give the Volt’s interface a snazzier aesthetic, but the lack of haptic feedback ultimately prove too frustrating while driving. Thankfully, the Volt includes traditional dials for audio and menu controls as well. Standard MyLink audio sources for the 2013 Volt include AM/FM/SiriusXM radio, a CD player with MP3 playerback, and USB/AUX inputs. Bluetooth audio streaming and hands-free calling are also available. Pairing a smartphone is easy, and the MyLink system streams tracks from your iPod or iPhone… with a few hiccups. You can’t have your smartphone charging while you stream music from apps like Pandora and Spotify, and the playback sometimes stuttered and stopped for no reason. The Volt comes with a standard six-speaker sound system, but for an enhanced audio experience we recommend optioning the energy-efficient Premium Bose package. For $500, you get an upgraded seven-speaker system that includes a subwoofer and more vibrant sound quality piping through the cabin. Navigation isn’t standard in the 2013 Volt, which given its base price of $39,000 is pretty unacceptable. Drivers will need to shell out an additional $895 for nav, or risk the open road while channeling their inner Magellan. Opting for navigation grants you access to SiriusXM NavTraffic updates. Despite a few issues here and there, most Volt drivers will find the MyLink easy to use. There can be a tiny learning curve, and the capacitive controls don’t help matters, but overall it’s a competent system. The sheer wealth of information at your disposal, ranging from battery status and charging schedules to local movie times, is impressive. Because connectivity is all the rage these days, the Volt accommodates the traveling techie with a trio of apps that keep you synced to both your ride and the world. Android and iPhone users can download Volt Driver Challenger, which serves as a mobile community for Volt owners to track their fuel efficiency, set up fuel-saving goals, and pit them against other Volt drivers. You can earn achievements, receive scorecards, and earn your very own spot on the VDC leaderboards. 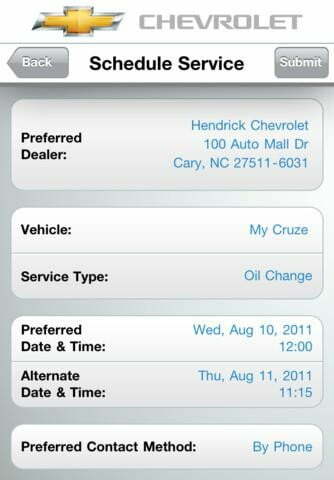 OnStar RemoteLink is another app that marries your smartphone and the Volt. Here, you can monitor battery charge, remotely verify if your Volt is plugged in, receive charging alters, and schedule future charging times. 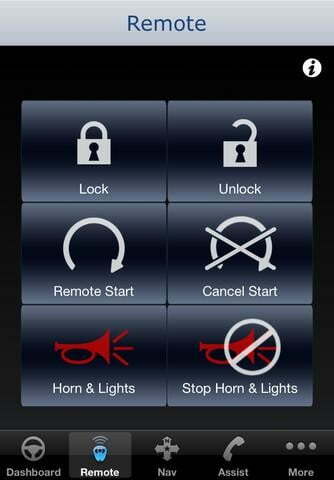 The app even lets you unlock or remotely start your Volt. 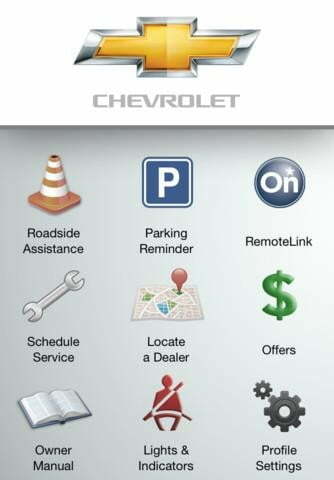 Finally, the myChevrolet apps provides a digital owner’s manual, schedule service, access to roadside assistance, and stores your parking location for easy reference. Despite the Volt’s status as Chevy’s green halo car, the exterior design is pretty tame. For 2013, the Volt sheds its black roof panel and liftgate (which we rather liked) for body-colored ones. Otherwise there are really no discernible cosmetic differences from 2011 and 2012 models. Is it electric? Is it a hybrid? Is it going to hurt? Yes, yes, and no – well, maybe just your wallet. GM likes to describe the Volt as an electric vehicle with a “range-extending” gasoline powered engine, but simply put, it’s a plug-in hybrid. The front wheels are powered by an electric motor that provides 149 horsepower and 273 pound-feet of torque. Feeding the electric motor is a T-shaped, 5.5-foot long 16.5-kWh lithium-ion battery weighing 435 pounds. 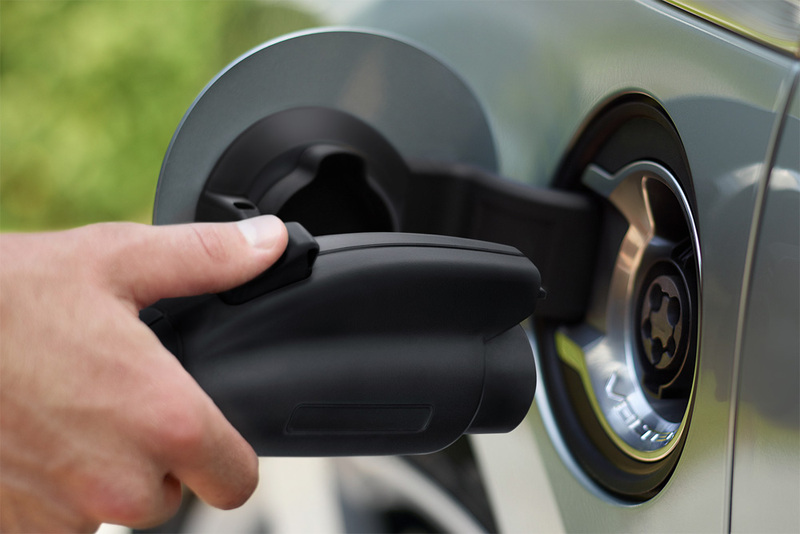 Once the Volt’s battery is depleted to 70 percent of its maximum charge, the Volt’s 1.4-liter four-cylinder gas engine kicks in to help power the electric motor. In certain situations, the Volt’s gasoline-powered engine can kick in to boost performance – while driving uphill, for example. Total range for the Volt will vary, and it’s important to note that over the lifespan of the vehicle these figures will begin to drop as battery capacity naturally diminishes. During our week-long review period we averaged about 33 miles on a single charge, however, official EPA-ratings give the Volt a 35 to 38 mile range. The Volt’s regenerative breaking can aid slightly in this regard. To some, the Volt’s total battery range might not seem like a lot, but considering the car’s closest plug-in rival, the Prius plug-in, can travel only 15-17 miles on a single charge of its 4.4 kWh lithium-ion battery, and that’s a significant improvement. Once every electron has been squeezed from the Volt’s battery, the gasoline engine kicks in and can extend the vehicle’s total range up to about 300 miles. 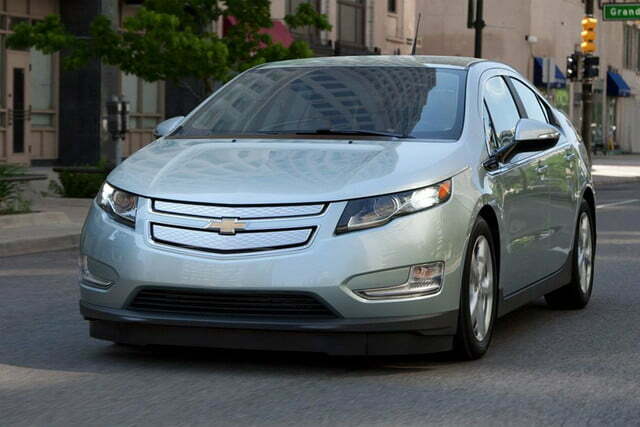 The Volt’s total efficiency rating sits at 98 MPGe (miles per gallon equivalent). For the uninitiated, MPGe represents the number of miles a vehicle can go using a quantity of fuel with the same energy content as a single gallon of gasoline, which roughly equates to about 34 kWh. On gasoline alone, however, EPA-estimates place the Volt’s miles per gallon rating at 35 in the city, 40 on the highway, and 37 combined. For 2013, Chevy slightly increased the energy capacity of the lithium-ion battery pack from 16 kilowatt-hours to 16.5 kWh. While this boost translates to more useable energy and slightly longer distances, the change in chemistry also equates to slightly increased charge times: 10.5 hours on a standard 120-volt wall outlet and 4.5 hours using an optional 240-volt charger, which is up from 10 hours and 4 hours, respectively. Hybrids and plug-in hybrids catch a bad rap when it comes to driving dynamics – and for good reason. The Toyota Prius might be a marathoner, but its rigid handling is about as exciting as watching reruns of Bob Ross’ The Joy of Painting on a sunny afternoon. The 2013 Volt, on the other hand, injects some power and dynamism to its ride thanks to the instant torque on hand from its electric motor. Acceleration is quick, and the Volt eschews the sleepy handling characteristic commonly associated with hybrids like the Toyota Prius, feeling much more stable and planted to the road. 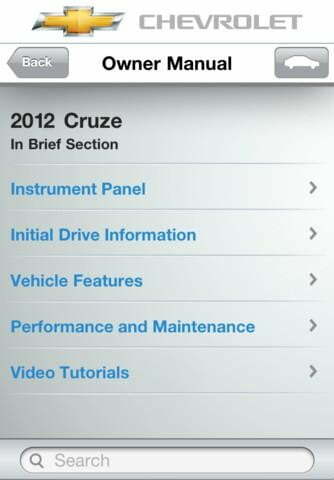 The 2013 Volt features four different drive modes: Normal, Sport, Mountain, and Hold. Normal Mode is about as ordinary as it gets, Sport Mode ups the amperage with heightened steering feedback and improved acceleration, while Mountain Mode increases energy reserves in the battery by enhancing regenerative breaking. We’ll let you guess where Mountain Mode is most effective (hint: not the city). For 2013, the GM has imported Hold Mode, which has previously only been available in the Volt’s European cousin, the Opel Ampera. 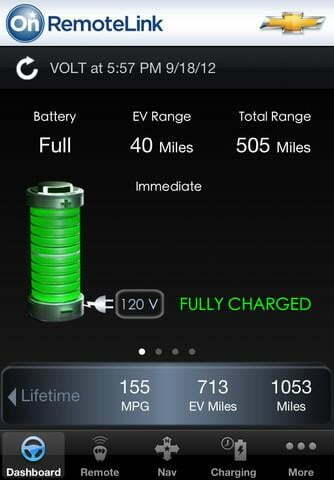 Activating Hold Mode tells the Volt to conserve battery power and use its gasoline engine instead. Hold Mode is best utilized on long stretches of freeway driving where battery charge is more rapidly exhausted, as opposed to city driving where battery power is used more efficiently. Despite all the political charge (pun thoroughly intended) surrounding it, the NHTSA inquiry over battery fires, and GM’s confusing batch of initial ads, the Chevy Volt is an excellent car and one of the most advanced on the market. It’s a potent mix of electric and gasoline, and one that should help mitigate fears regarding range anxiety, as well as minimize fear over the viability of electrically-powered vehicles as a whole. Throw in the fact that many drivers will be able to undertake their daily commutes without ever using a single drop of gas, and that alone is a compelling argument for the Volt. 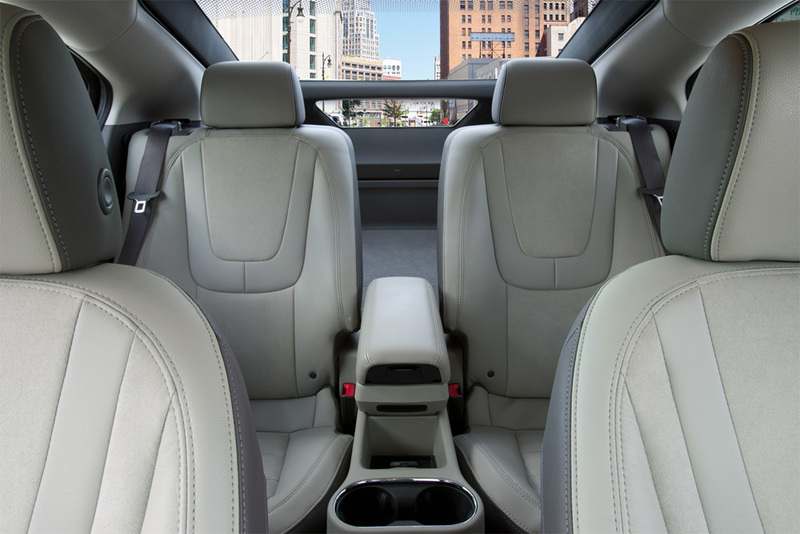 Of course, the Volt is every bit as comfortable and technically advanced on the inside. Barring some minor grievances regarding its capacitive touch interface, the sheer wealth of connectivity and information at your fingertips should please even the staunchest of Luddites. However, the main issue zapping the Volt’s mass market appeal is its price tag: At $40,000 (sans a $7,500 Federal tax incentive) the Volt is, and will primarily remain, a car for early adopters and deep-pocketed eco warriors, which is a shame considering how damn good it is.